I was up at my grandfathers house in Illinois and found a patch of wild garlic growing on the edge of a corn field near his business. 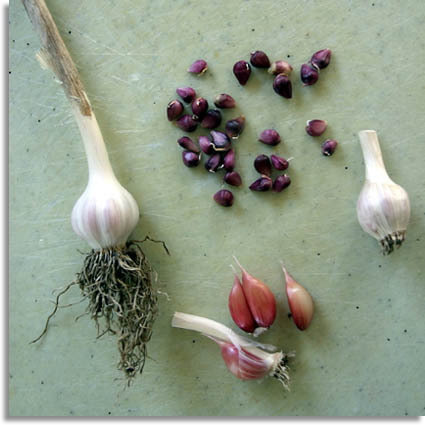 I got about 100 bulbets to plant next year, and a half dozen mature garlic bulbs to cook with. Not wanting to appear too dumb but what is the difference between wild and domestic? I think you can plant them now or in the fall of the year, so they have better developed roots and bulbs over the winter. Those small seeds will dry up quickly if not planted. The bulbs should hold over winter, but not the smaller seeds. chief joe wrote: Not wanting to appear too dumb but what is the difference between wild and domestic? Nothing dumb about that question. I am no expert. In fact this is the first year I have had domestic garlic plants. We have had garlic chives for years, and I/we love to cook with them, but this is our first year to have garlic bulbs. Garlic is of course a type of onion and the plants are very similar. Their are several varieties of domestic garlic, and they all seem to be pretty similar (to me). The main difference I can see is that the domestic varieties seem, in general, to have larger bulbs. Some seem to have a stronger or weaker flavor and odor, but I haven't had enough experience to tell which is "better" to me. Wild garlic, although smaller, is very appealing to me, because I love the natural, gathering aspect of it. The flavor is great and they are naturally organic in most cases. bodean9 wrote: I think you can plant them now or in the fall of the year, so they have better developed roots and bulbs over the winter. Again, this is my first year with domestic garlic, but it is my understanding that typically, at least in our region, region 7, the seeds are planted in late summer, early fall. If you buy them as started plants like we did, spring is fine for planting. bodean9 wrote: The bulbs should hold over winter, but not the smaller seeds. The mature bulbs should be harvested every year. If you don't they just rot in the ground. It is my understanding that they are not like the bulb of a tulip that multiplies with time. Awesome. We are in the berry picking season so have been picking blueberries mostly but did get some salmon berries and even cloud berries from our forrest.